Huh? 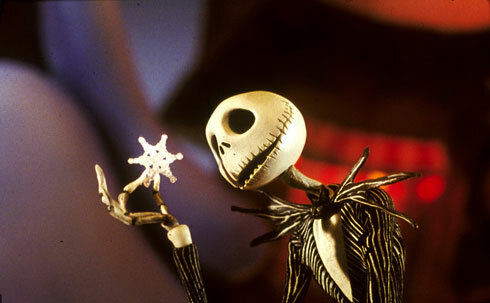 Let me 'splain to you Lucy. 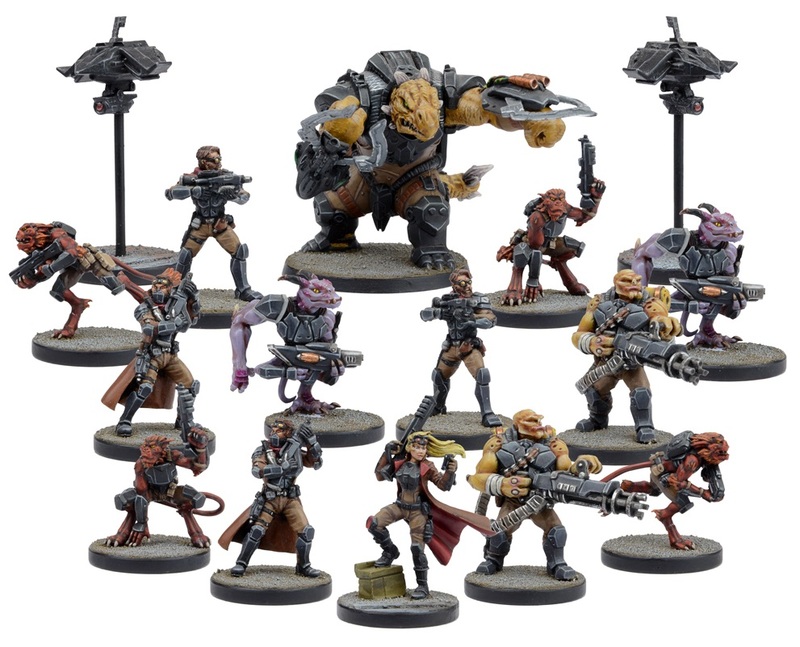 If you have paid attention, then you know that they have repackaged all the factions for Deadzone into starters and boosters and they are all consistently priced at a MSRP of $39.99. 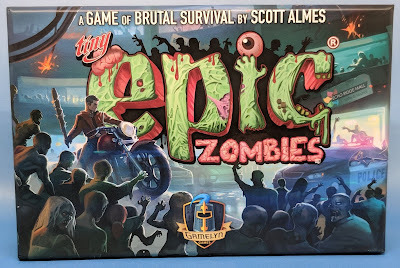 Enforcers and Forge Fathers came out with the retail release of the new edition, Veer-myn and Asterians are out this month with the Infestation expansion. 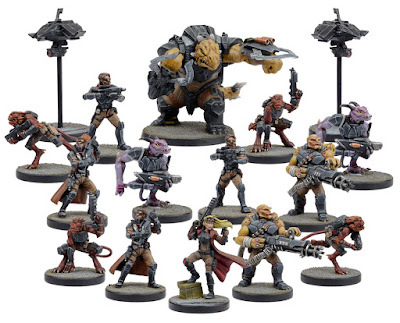 Rebs and Marauders are out next month. 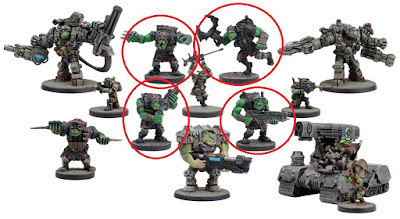 None of these are new models (rebs didn't get much love in the kickstarter), so honestly not very exciting. 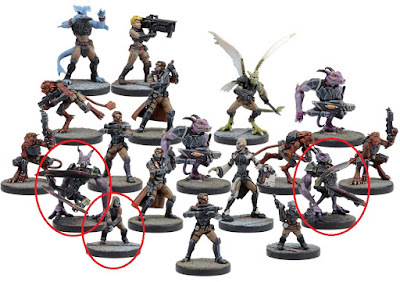 I've circled the models that caught my attention here. First could just be my faulty memory - but were there already 2 zees? Maybe, I'm not sure. 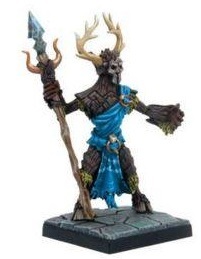 But there weren't models for Soraks with Ceremonial Blades (5 pts, 1 vp, give AP1). It looks like they are sneaking in a new sculpt into the booster. 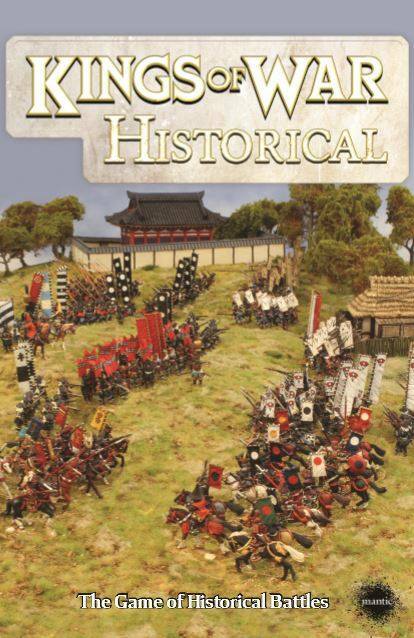 Unfortunately you can't buy the models separately - but still it is something for rebs players to get excited about. There it goes again. 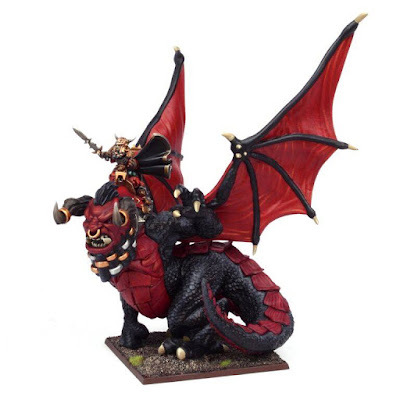 Ever since the first kickstarter, marauder (and KoW goblin) players have been asking for Mawbeasts. The bombers were cool - but people often don't want to play with models that intentionally blow up (giving their opponents vp). so we were left to convert our own - either removing the bombs, or cutting the legs off of the goblin fleabag riders. 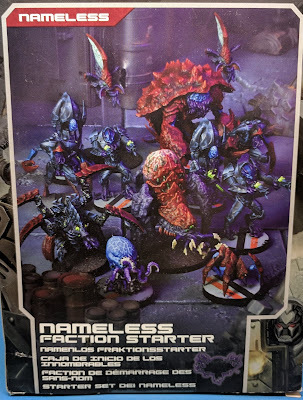 Well looks like Mantic is sneaking in 2 new mawbeast sculpts. 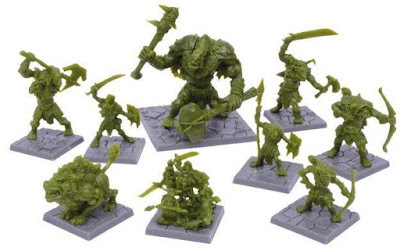 I do hope they will do some sort of repackaging of these for goblins for Kings of War as well (where you need 10 or 20 of them). Still, pretty cool. 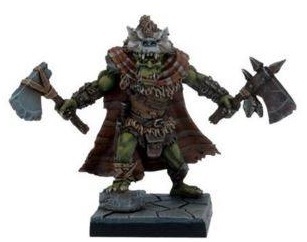 (It is also NOT the same sculpt as comes in the Dungeon Saga: Warlord of Galahir expansion coming out next month - so there are now 4 (if you include the metal one from the Magwa & Joos pack) mawbeast sculpts out there). But wait - what's this? I don't recognize those commandos. Is that a claw? Ripper Talons? Is that one holding an HMG (with the ammo belt hanging from it - looks like a Heavy Machine Gun to me!). The heads for all of these are NOT the same as before - and they look (to me, from the picture at least) like these are brand new sculpts. So looks like the rebs and marauders did get some love from the new edition. 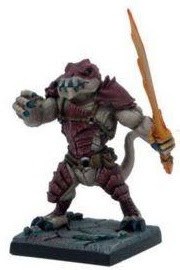 Let me know if I'm wrong about the Sorak w/ Ceremonial Blades, Mawbeasts and Commandos (with claw, ripper talons, and HMG) - but I have all the original sets and those sure look new to me. Now, some updates for previous posts. First, for those who want to see them, are some of the production pictures from the Warlord of Galahir Dungeon Saga Expansion. 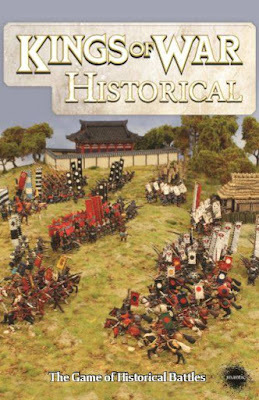 Lastly - I gave some estimated prices last week for the new Empire of Dust miniatures - and while I nailed the mega and starter army - the Skeletons, Archers and Revenants are all $34.99 (no $29.99 like I was expecting), and the balefire catapult is $19.99. In addition the swarms, enslaved guardians and heroes are NOT on the July release list - so most likely coming out in August instead. 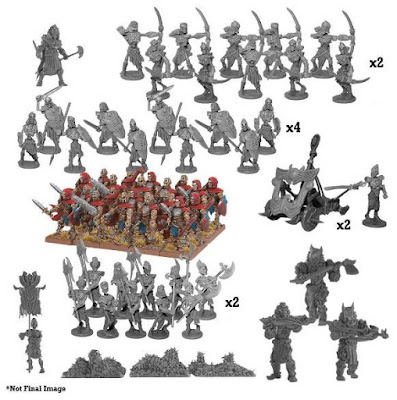 The Soraks are the metal ones that were offered after the initial Kickstarter in a survey but never made it to retail. The commandos I think have an optional upgrade pack that was also offered after the first ks also. 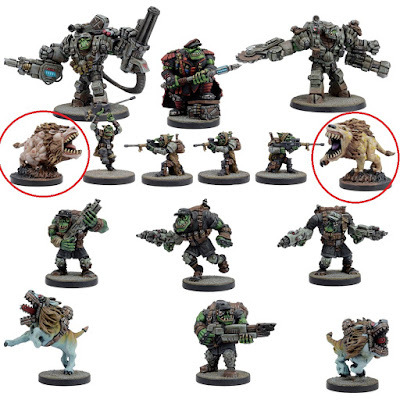 Lastly the mawbeast are the KoW ones I believe which is cool to see them entering Deadzone! what fallinfantry said soraks are metal from ks and yes they were two zee's in original booster.